Lean logistics quality improvement programs have driven billions of dollars’ worth of value across corporate supply chains. But, if you’re not careful, these programs can become weighed down with bureaucracy --meetings, paperwork, reporting and budgets -- adding time and cost to your quality improvement efforts. We write about it in our recent Viewpoint paper: "How Lean is Lean?" At KANE, we have made a corporate commitment to continuous improvement using Lean Six Sigma methodologies. But our program has been fine tuned to be highly practical and easy to implement. It’s all in the implementation. Here are some ways in which the management of Lean programs can get in the way. Meetings, Lean charters, complicated reporting requirements… These and other administrative trappings can make continuous improvement more of a homework assignment than an opportunity to make things better. As a result, someone with a good idea may be reluctant to put it forward. As corporate dollars are allocated to Lean programs, the pressure mounts to show an ROI. Consequently, tactical assignments that could be handled with a meeting or a few phone calls get put forward as formal Lean logistics projects in order to justify a budget spend. 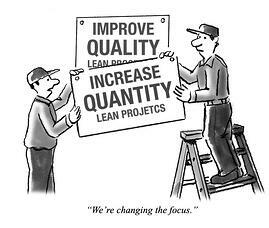 The Lean movement began as a grass roots effort to eliminate waste and improve quality. Simple, unpretentious and important. and getting the work done.